You and your band have a nice gig and you want to do that with a Keyboard-player. You are planning a tour in Holland or Europe. Normally you have your own Keyboard-player but through of circumstances he or she can’t join you. You want to make a CD and you need to lighten it up with a Hammond or Keyboard. Then you can hire me for those gigs or recordings. I’ve done these kind of project over the years and its always an inspiration to work under pressure with a whole new group of people. 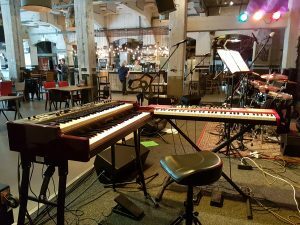 For more information see the other pages on this website or contact me by E-mail Frankie@bluesorgan.nl, or see the contact page.